Each school should aim to provide competitors in the age groups below. Ideally 4 students (1 team) should be nominated in each team for Div A and Div B. Several teams from a school may be accommodated in each division, but pleased check with the coordinator first. Reserves may compete in the place of a competitor provided the facilitators are informed. All student teams are to be accompanied by a teacher from the school. 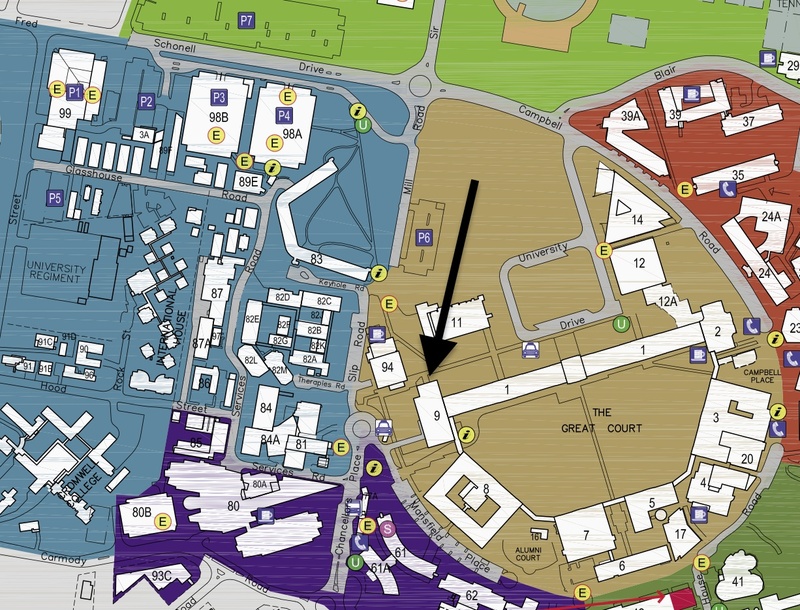 Meet at the Michie building (Building 9) as indicated by the black arrow. No materials are required. However, topics will be released to participating schools prior to the Philosothon and students can review their notes regarding the topics prior to commencing the Communities of Inquiry. Cost: $22 per student. Payment is possible on the day, though registration through the attached form is essential. Details of electronic payment will be made available on registration. Could machines be moral? Why would a machine need to be moral? What role might a thinking machine have in our society? How could we give machines morals? Would they develop their own morals? Happiness is not necessary for a good life. What do we mean by happiness? Is happiness over-rated? What is the relationship between happiness and living a good life? What could it mean to live a good life? We are who we choose to be. What makes us what we are? Can we choose our personality? How can we grow from the people we currently are? Are our past experiences more important in shaping us than our desired for the future? Does ‘identity’ refer only to an individual? “Liberty consists in doing what one desires” John Stuart Mill Is freedom just about lack of constraints? Would I be happier if I could do whatever I wanted whenever I wanted to? How could our individual freedoms affect others? “The unexamined life is not worth living” Socrates Is thinking about our life more important than just living it? What things about our lives could we ‘examine’, and why would we bother? How can we evaluate the worth of our lives? Could thinking machines know the difference between right and wrong? Why would a machine need to be moral? What role might a thinking machine have in our society? How could we give machines morals? Would they develop their own morals? Happiness is the most important thing in life. What do we mean by happiness? Can we choose to be happy? What other things in life could be more important than being happy? Is our individual happiness more important than the happiness of others? I couldn’t be myself without other people. What would we be like if we did not know other people? If we know the same people as someone else, does that make us more alike? Do we choose our friends or find them? The best kind of world would be one where I could do whatever I wanted. What does it mean to be free? What does ‘whatever I wanted’ mean? How could our individual freedoms affect others? Mahatma Ghandi What does it mean to be a ‘great’ society? What kinds of weaknesses could we mean? Who should look after weaker members? What would happen if we didn’t look after them? Should moral issues be decided by experts or by the general population? Do moral issues require special training?Is morality defined by popular understanding?What role does reason have in morality? Mercy is essential for justice. Should the punishment fit the crime?What is the role of punishment?Should punishment always be onerous?Does capital punishment have a role? Rights are for rich people. Are we more outraged by injustices against people who are like us than against those who are not?Where do rights come from?Who makes sure our rights are respected? We care more for our pets than for some people, and that’s OK. Are all people more important than all animals?Do we need to care about everyone?Is it healthy to care for an animal as much as a person? Our identity is as much a virtual construct as a physical one. Who are you? Are you the same on social media as in real life?Is social media just an extension of real life interactions, or is it something different?Would you be the same person without social media?What could social media, or electronic interactions, become? Science is more important than philosophy to the future of humanity. Are things are more important than ideas?Are advances in technology the best way to measure progress?Have we solved the most important philosophical questions? Who should decide what is right and wrong? Are the ‘experts’ the best to judge what is right and wrong, or should it be the general public?Are some cultures ‘wiser’ than other cultures?What does it mean to say that something is right or wrong? We should always respect the elderly. Are we all wiser when older?Do all older people know more than all younger people?Do we get better in all important aspects as we age? Is it possible to live a good life without being happy? What does it mean to be happy?Why is being happy important?What other things might be more important than being happy? Topic 1: Are we more than genes and environment? Topic 3: Is society more than just a bunch on individuals acting for themselves? Topic 4: Can humans only progress through science? Topic 5: Do we just make up what human rights are? Topic 1: Are we responsible for the well-being people of in other countries? Topic 2: Should freedom of speech be limited? When should you not be free to speak? Topic 3: Does it matter what gender I am? Topic 4: Is reason more important than emotions? How closely is reason related to emotion? IB essay title. Reason and emotion at war? Topic 5: If humans can have rights, should other animals?